Have you been to a farmers’ market lately? Well, my friend Priya has, and she came back with a basket of market goods for me to cook with. Lucky me! 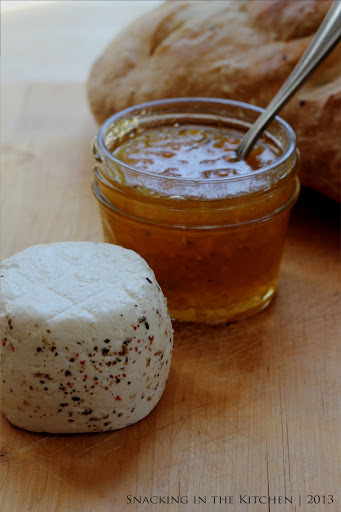 I immediately reached out for a crusty loaf of olive-rosemary bread, amber-colored glass jar of spicy apricot jam, and soft, herb cheese. Wouldn’t they make a perfect appetizer? 2. Slice bread into 1/3 inch slices and lightly drizzle with olive oil. Season with salt and ground black pepper. 3. Toast bread on both sides until golden-brown and crusty, about 5 minutes. 4. Rub garlic over both sides of toast. 5. 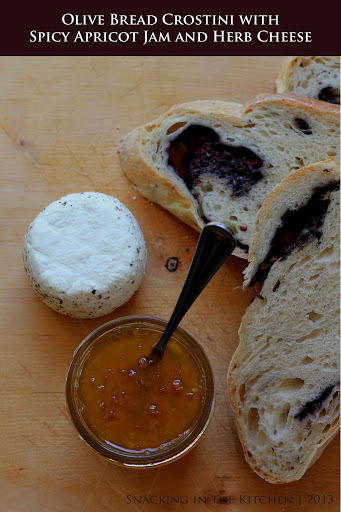 Spread cheese and jam over the bread and eat immediately. 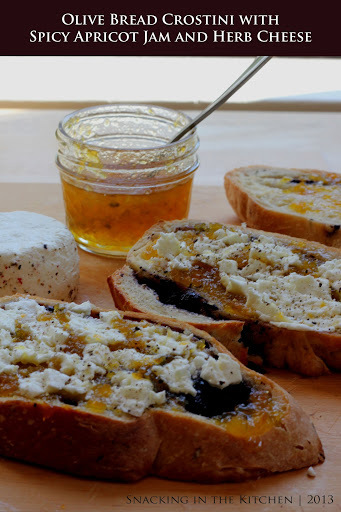 I am thinking a glass of chilled sparkling wine would go well with the crostini.